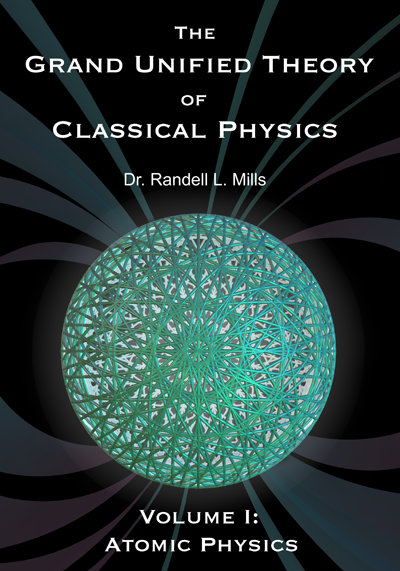 For more information download the book: The Grand Unified Theory of Classical Physics by Dr. Randell Mills. Free download in DjVu format available. "The Millsian results were within an average relative deviation of about 0.1% of the experimental values and the 3-21G and 6-31G* results deviated over a wide range of relative error of 30-150%." "The methods and algorithms that utilize Mills classical physics atomic and molecular solutions in the Millsian 2.0 molecular modeling software package." The Nature of the Chemical Bond Revisited and an Alternative Maxwellian Approach - R.L. Mills, Physics Essays, Vol. 17, No. 3, September (2004), pp. 342-389. "A proposed solution based on physical laws and fully compliant with Maxwell's equations solves the parameters of molecular ions and molecules of hydrogen isotopes in closed form equations with fundamental constants only. The agreement is remarkable." Exact Classical Quantum Mechanical Solutions for Atomic Helium Which Predicts Conjugate Parameters from a Unique Solution for the First Time - R.L. Mills, Physics Essays, Vol. 21(2), (2008), 103141. The Fallacy of Feynman's Argument on the Stability of the Hydrogen Atom According to Quantum Mechanics - R.L. Mills, Annales de la Fondation Louis de Broglie, Vol. 30, No. 2, (2005), pp. 129-151. Exact Classical Quantum Mechanical Solutions for One- Through Twenty-Electron Atoms- R.L. Mills, Physics Essays, Vol. 18, No. 3, September, (2005), pp. 321–361. Classical Quantum Mechanics - R. Mills, Physics Essays, Vol. 16, No. 4, December (2003), pp. 433-498.